Big ice storm, as of 3pm internet is down. It's not letting up and I might not make it online tonight. Good luck Lip. Hope you guys don't lose power. Last night we got 1 - 2 inches of sleet / ice. Thought it might be soft enough to shovel this morning....ha ha, dream on....can't touch it. No problems with power here, luckily. Damn, and we are experiencing heavy rain! Well we go as best as possible!! Internet is back up again. .... and here my air-conditioner is running.... heh heh.... no kidding.... I am glad it stayed a little cool... only 76° today. It was in the 80's last weekend. Darn Winter is over already.... it never lasts. We're also supposed to get even more ice today, and what really pisses me off is that it's going to weld it in place by dropping to 8 deg. F tonight and staying below freezing for the foreseeable future. AND the winds are going to increase to around 35 mph. The roads will be relatively OK because Michigan has outstanding road crews. But a better recipe for disaster for the power and overhead lines you could not have, and driveways/sidewalks will be screwed for a long time. All we need now is a bunch of snow to fall on top of it all to seal our misery. This is very unusual for Michigan! Normally winter is winter here; it stays cold, and regular old snow is far easier to deal with. We did not lose power, which is rather amazing based on the amount of ice we have on the ground. Very odd storm as it was -4c and raining heavily for almost the entire day. Roads are in pretty good shape, but the driveways and sidewalks are a horror show right now. I can honestly say I have never put so much ice melt down in a 24 hour period. 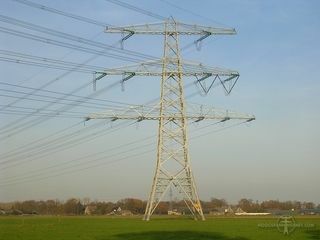 I'm always glad that apart from these we have in the Netherlands all our pipes and cables in the ground. I ran out of what I had, and it didn't even touch it. The thing is when it comes to high voltage, you can't really put it in the ground because there's a limit to what even the best insulation can stand. Those high voltage lines are uninsulated, because the air itself is the insulation. The more space you have between them and how far they are above the ground, the more isolated they are. Of course they have to hang from the tower....that's what those ceramic discs are for which are stacked together. You can get an idea of how high the voltage being carried on the line is, just by seeing how many of those disks are ganged together. In the U.S., we have so much more land area to serve that there's a lot of long distances that require high voltage runs; and we have to distribute that also from many substations, and even though the voltage it stepped down somewhat, it's still high voltage and is carried on lesser lines on smaller towers and wooden poles. On those poles, the power lines are always the highest lines on the pole....telephone and coax cable are lower down. When the power supply lines step down to standard voltage, it does go underground many times here too, especially in residential and business areas. But they often don't go to that expense and it depends on how dense the structures that need electricity are in any area. Also another concern is that we have far more land area that is in cold, winter climates. In those places, underground repair becomes very impractical due to the ground being frozen in winter months. Underground cables can fail just because the insulation breaks down over time, so they need to be repairable. Troll Troll Troll my boat.... hah hah.... well it DID make it down here... you will be happy to know that it got down to 38°... I had to wear my toque from the car to the building today.... and it is going to hang around we won't be back in the 70's again until next week. FREE AIR CONDITIONING ! YAY!